Come to the Veterans Career Fair to learn about employment opportunities! The keynote speaker is John DiNapoli, the President of Spencer Ryan LLC and Brigadier General US Army (Ret.). There will be employers with job openings available, workshops, one-on-one advice, and job search resources. The cost is $25 for pre-registered members, $35 for late registration (after November 3), and free complimentary admission for veterans, transitioning service members, and spouses. This event is presented by the Camden County Board of Freeholders and the Chamber of Commerce Southern New Jersey. 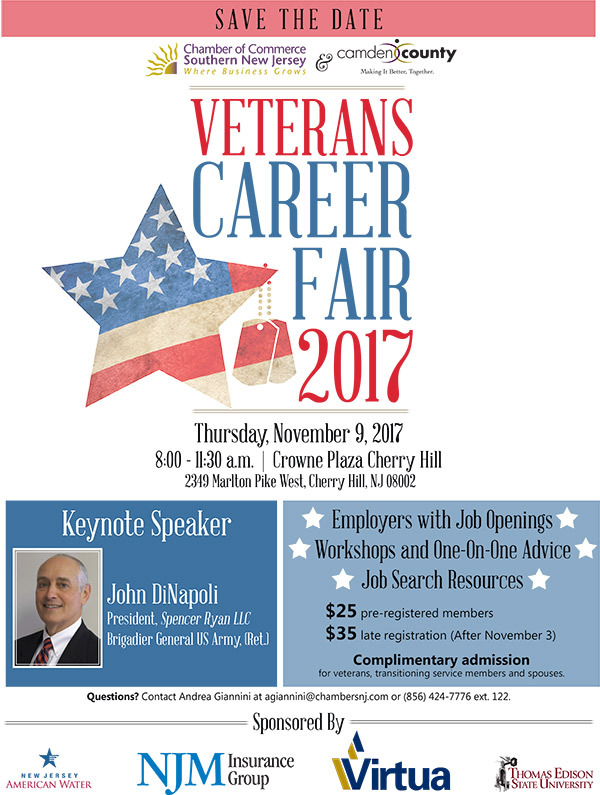 It will be held on Thursday, November 9th, 2017 from 8 AM to 11:30 AM at the Crowne Plaza in Cherry Hill. If you have any questions please contact Andrea Giannini at [email protected] or at 856-424-7776.